Over on All Things Upper Elementary, I wrote about my first attempts to use Edmodo with my class. To sum up, it has some great features for my fourth graders, and they were very excited about it. However, because I have more experience with Weebly as a classroom blog, I feel as though I need to decide for next year: will I use Edmodo, Weebly, or both? Today I weighed the benefits of each in order to come to a decision. 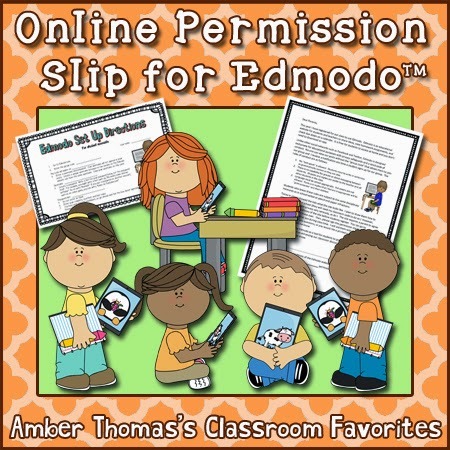 Allow teachers to publish text, photos, documents, and links. It's great to have a "home base" when you want students to go to a new website ("go to our page and click the link" instead of "type in this long address"). It's also great for kids to use at home as a study tool if you post your anchor charts, Educreations videos, or YouTube videos of demonstrations you've shown in class. Allow students to post replies. Allow teachers to "moderate" comments (which means they are not published until the teacher approves them) if you wish, as well as turn off moderation (so kids' comments appear immediately) if you wish. Any post or comment can be deleted at any time. Get kids excited about reading and typing for an authentic purpose. 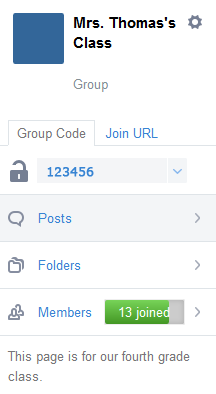 Edmodo appeals to kids because it looks like Facebook. 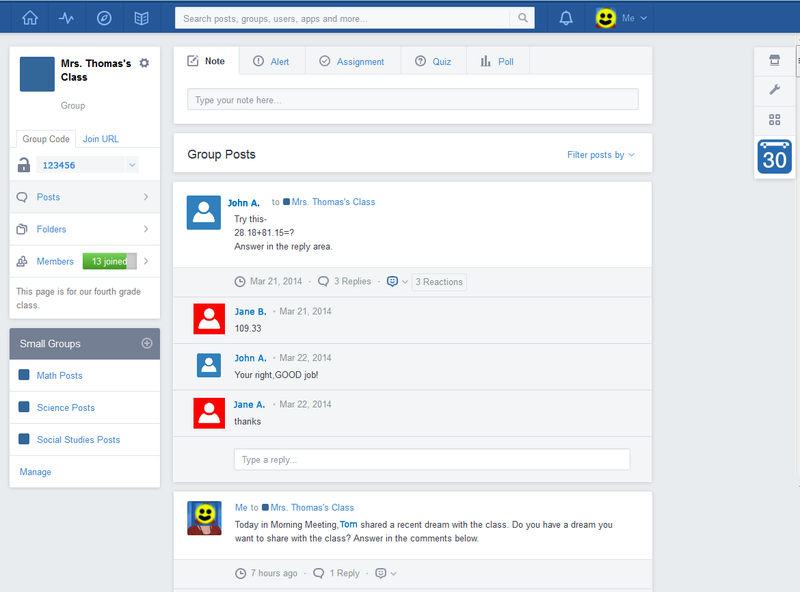 Edmodo is much more "social" as opposed to Weebly, which is more teacher driven. That is, on Weebly the teacher writes posts, and the kids can click "reply" to respond. Kids can view each other's comments by clicking "comments." 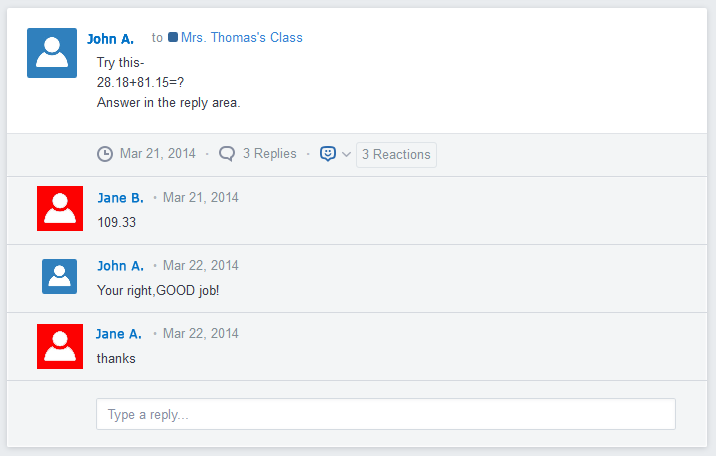 On the other hand, on Edmodo, kids can see all replies at a glance. They can write their own posts, not just reply to the teacher's. They can even upload pictures and links. All that felt really scary to me at first! However, as my instructor said, most kids are not going to post inappropriate things right in front of their teacher any more than they are going to stand up in the middle of class and say inappropriate things or display inappropriate photos. (Of course, if your students are the sort who would, see above regarding how to moderate posts). Edmodo has built in online storage. They can save a document they are working on in class into their Edmodo "backpack," then save it onto their computer at home. Privacy. The kids and I can post photos on Edmodo. When I used Weebly the only photos I posted had their faces cropped or digitally covered. Now they can see their pictures of class parties, showing off projects, and so on. Polls. This is a niche thing, but for fourth graders to see their votes turn into a bar graph is a great learning experience in and of itself. Edmodo also makes voting easy, private, and fun. Quizzes. Like Google Docs, it is possible to create a "form" that can be used for online quizzes. The idea of having it all integrated is nice. Teaching communities. It's not just the kids who benefit from Edmodo. If you participate in the online communities, you will be surprised what ideas and resources teachers from around the world can offer you in no time! Features I haven't mastered yet. There are alerts, assignments, and a calendar on Edmodo. I can keep more control. I fear that if the kids can post whatever they like, there will be too much junk to weed through to get to the content I want them to see at home. There are filters on Edmodo, such as "view posts from the teacher," but for fourth grade it seems like one step too many in terms of accessing information. I can keep posts more organized. Although both sites allow posts to be organized (such as math posts, science posts, and so on), I don't think I have the ability to move a post if the kids (or I) post in the wrong area by mistake. There are also archives by month in Weebly that I don't see in Edmodo. I can schedule posts. In Edmodo, when you post there is a time stamp and to my knowledge those posts can not be reordered; it's there the moment you click "send." And if I'm up very late on a school night, I don't like having my students see that reflected in the time I post (it just sets a bad example). In Weebly, although I can't schedule posts in advance (to my knowledge) I can move posts around. So if I write 3 posts and I want the math one to appear at the top, I can change the dates to post date the other two. It's not the most profound reason, but as much as the kids like the look of Edmodo, I don't. My Weebly blog has a lot more "personality" with the background image, custom banner, my choice of fonts, and so on. I can create pages in Weebly. I like to have important information on separate pages, such as "How to Log in to Study Island" and "News for Parents." I don't see that on Edmodo. I feel like those things we talk about at the beginning of the year that I want them to access all year will get lost in the mix. No username and password hassle. On Edmodo, with every child using a different password (and forgetting) it adds an extra management piece that is more of a hassle. I'm not sure I need those extra features (alerts, assignments, and a calendar). I have to admit I don't love kids seeing things on there that I'm not updating; it makes me feel like a slacker! I think that next year I'm going to do exactly what I did this year. Start out with the Weebly blog. It's easier to manage. Then, as with all good teaching, the time will come for "gradual release of responsibility." We will switch over to Edmodo when they have seen me model what a good post looks like, (informative, but encourages a response from readers) I feel that their comments are on topic, and I can trust them to represent themselves well online. It's working for us this year, so I will do the same next year. Do you use either of these online platforms with your class, or have you tried one of the others? I appreciate your pros and cons on these two platforms. I am currently using www.joyfullyteaching.bogspot.com and have been pretty successful with allowing the kids to blog and add information themselves. Mrs. Yolis' Classroom Blog was a great source of inspiration and gave me a tip about allowing the kids to post and add photos on this blog. I will be thinking about the choice of blog or website to use for this next year. I love using technology in the classroom and want a secure website for my third grade students. Your website is very cute! Thanks for the tip about Mrs. Yolis' Classroom Blog. Thank you. I have also taught my kids to use Google docs to first write there posts or comments since they are only third graders and need some help with writing complete sentences and spelling. Students d not need to have email accounts because I created one gmail account for our entire class and therefore when they are working on writing using the google docs in class I can see all their documents. This helps to correct for them any errors and saves automatically. Then when they have my approval, I allow them to copy and paste their comments into the blog. At the end of the semester if they do a good job with this, I am making them a blog under another name as a class and using blogspot allows me to create as many blogs for my students as I need. I cannot moderate, but that is the only thing I do not like. My parents will have to sign a permission slip for having their blog on the class blogspot site, but I really want the kids to have a portfolio and add their essays, stories, and poetry there on their blogs. It will be anxious to see how it works out this year. 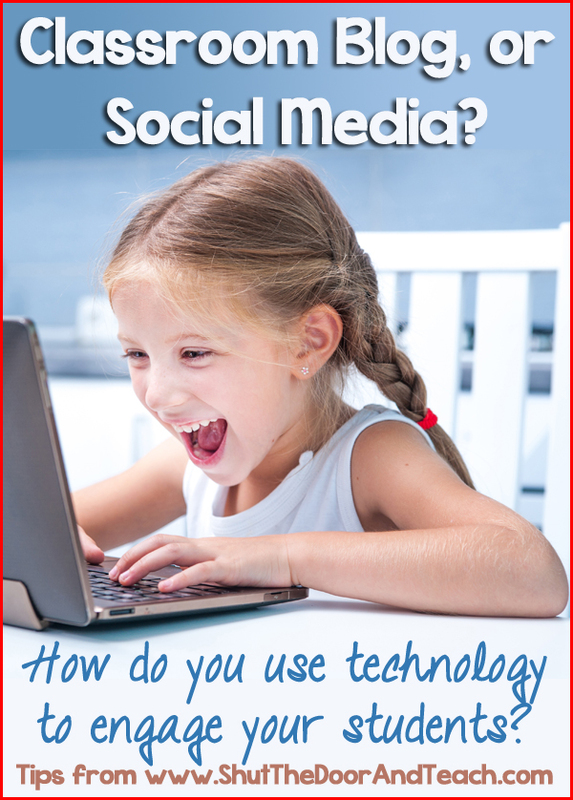 I'll be working with fourth graders this year and am leaning towards using Kidblog. I've used it with small groups before and was happy with it, so I'm excited to try it with a whole class. I've heard great things about Kidblog too, although I have never tried it. I'd love to read a post on the pros and cons of Weebly vs. Kidblog!